Cut-to-Length Aluminum Extrusions - SAF from GA & CA SAF – Southern Aluminum Finishing Co, Inc.
We have NO MINIMUM order requirements for extrusions cut from mill standard aluminum stock. This service is ideal for contractors, hobbyists, educational institutions, laboratories, research, and do-it-yourselfers. 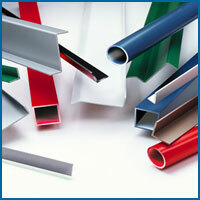 Tell us what you want and we can usually cut, pack, and ship your aluminum extrusion order via UPS. To expedite we suggest you have the your aluminum extrusion order charged to your VISA/Mastercard, which will be less costly to you than C.O.D. Call one of our inside sales representatives at (800) 241-7429. They will gladly help with your aluminum extrusion profile, shape, finishing, fabricating specification and write your order.